Did this website add value to your household or business? MarketMaker is an internet tool linking growers and producers with grocery stores, food processors, specialty outlets and food industry groups. The program also makes agricultural, seafood and outdoor tourism businesses accessible to individual consumers. The number of web users of the Mississippi MarketMaker website is shown in Fig. 1 below. There were more than 5,000 web users who accessed the Mississippi MarketMaker website each month during the last twelve months. 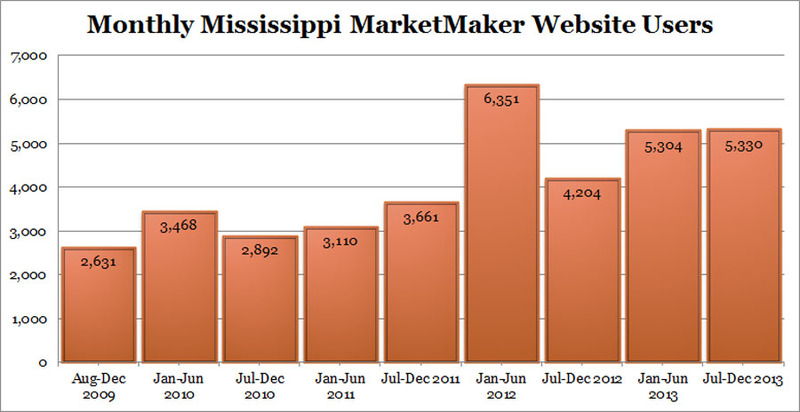 The number of web hits of the Mississippi MarketMaker website is shown in Fig. 2 below. The Mississippi MarketMaker website was accessed more than 70,000 times each month during the last 12 months. On the average, each of the more than 5,000 users visited the Mississippi MarketMaker website 16 times each web visit during the last 12 months. 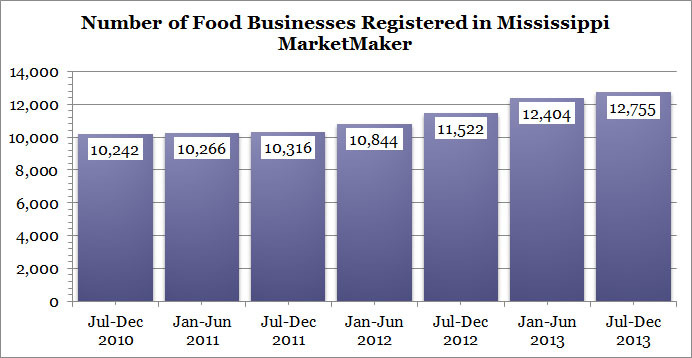 Toward the end of the year 2013, there were more than 12,400 businesses listed or registered in the Mississippi MarketMaker website, as Fig. 4 shows. “This program is funded in part through grants provided through Gulf States Marine Fisheries Commission, Oil Disaster Recovery Program under NOAA Fisheries grant award number NA10NMF4770481”.